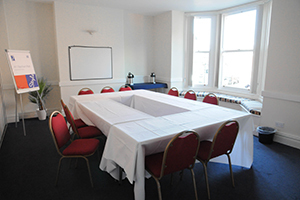 Based in Harrogate town centre our venue provides quality, and flexible meeting and training rooms. 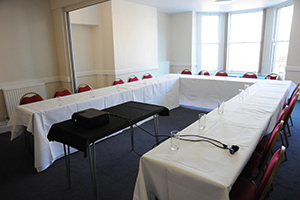 We deliver a simple, clear, and hassle-free booking experience, and we can offer bookings from as little as a one hour meeting or either a half day or full day meeting. We typically set our meeting rooms up in a classic boardroom lay-out, and our training rooms in either a classroom or U-shape seating arrangement but we will try to meet whatever requirement you are looking for. Whatever you have in mind be it training days, team meetings or grand exhibitions we are ready to help bring your next event to life. We know how to deliver on the day to make sure your meeting runs exactly as you have planned it. In addition to this we can offer delegate packages to include everything you might need to run a smooth professional event, keeping delegates and trainers happy all day long. 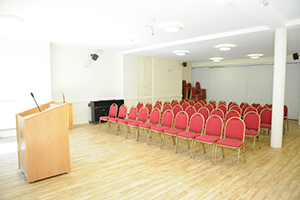 The St Robert’s Centre is situated just a short walk from the centre of Harrogate and the Harrogate International Centre, it is ideal for events of all styles and sizes. 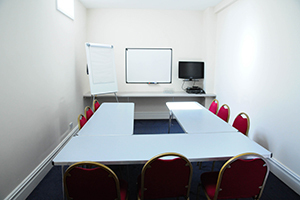 With a choice of rooms that can cater for the smallest board meeting, up to conferences for 100 delegates, with the latest business technology, the St Robert’s Centre is the obvious choice for your next business event. Here at the St Robert’s Centre we pride ourselves on our flexibility to tailor make the perfect delegate package to meet your needs. Give us the ideas and we will help your event come to life. For more information please contact St Robert’s Centre, Harrogate on 01423 529771.